This personal response should be read in conjunction with my report in Seen&Heard of the 8th London Competition, held in the City's ornate Goldsmiths' Hall three years ago. The competition, for long one of the most prestigious in the world, has come on apace. Around the actual competition there are master classes and talks, coaching sessions for students and amateur quartets, instrument seminars and workshops, and lunchtime recitals in central London churches by some of the quartets that didn't make it through to the semi-finals (full details of the competition at http://www.playquartet.com/). The change of venues, both acoustically ideal, encouraged attendance by large, knowledgeable audiences. Here is an ongoing, contemporaneous stage by stage report. 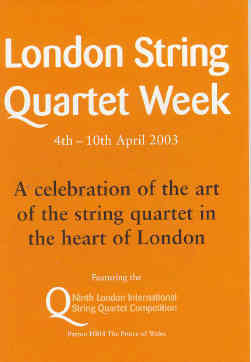 Eleven string quartets quartets were invited to London, selected by a team of judges (not members of the live competition jury) evaluating audio recordings 'blind'. My preferences were clear and positive. The Paizo Quartet* gave a better account of Nielsen than in either of my Scandinavian CDs of his four quartets. They were also the most exciting to watch, and I would tip them (of those I had heard by then) for an Audience Prize. The Jupiter Quartet gave as fine a performance of Brahms Op 51/1 as I ever need to hear, firm pulse, lustrous tone, an inwardness of feeling which breathed life in the present, in that hall. The Faust Quartet* gave a more convincing and idiomatic account of the tricky Schumann A major, which poses more interpretative problems than many another, than did the Johstons from Manchester, who began it began more tentatively. I failed to enjoy the Biava Quartet's performance of the Mendelssohn; perhaps it was over-prepared and too rigidly controlled? Luckily, the Jury does not have to rely on any single performance to assess an ensemble; plainly, in the above case, it would be a case of comparing unlikes (as it was in the Finals for the audience voting for the Audience Prize). Before being granted an opportunity to present Beethoven at Wigmore Hall, each quartet has to offer Mozart, a contemporary quartet of their own choice and, as the set piece, Dutilleux's Ainsi la Nuit (a modern classic this time instead of a newly composed quartet as previously, that presumably decided to reduce the additional stress of having to prepare a new work fast, as in previous competitions?). Each of those stages marked quite separately without regard for the others. Having had reservations about competition procedures, marking methods and (from an outside perspective) some of the results in other competitions, I would say at the outset that this one scores for thoroughness and scrupulous fairness, relying on marking without allowing discussion in which dominant members might influence others. This gruelling tri-partite event began at 6 p.m. and was scheduled to end around 11. In previous competitions, at Goldsmiths' Hall, Beethoven was reserved for the Finals; the change this year is welcome but the Beethoven evening still presents a problem for the audience. Two of the late quartets befor the first interval; where else but in a competition would that be inflicted on an audience? The whole reminds one of those grotesque concert programmes Beethoven himself put on, including some of the premieres of symphonies and so much else. Would not splitting the semi-finals into two normal length concerts not be more satisfactory for everyone? If next time it could be scheduled at a weekend afternoon and evening, with a long break between, would be accepteble on the same day and pay a proper respect to the composer? The hall was fully booked, but many came late and left before the end (ourselves included). My preferences were for the Danish Paizos in op. 131 and the Tankstreams from Sydney in op.59/1. The Jupiters began op.131 with reassuring maintenance of underlying pulse, which I had admired in their Brahms, but they tired towards the end (by which time I was also beginning to tire). Around the competition week, during which I heard all but one of the eleven quartets competing, I took also some opportunities to make comparisons between the stressful competitive situation, with BBC recording and a jury marking as they played, and ordinary concert life. What I, as a listener, seek is not an elusive "best" performance, to compare with many versions in memory or on recordings; just the more humble criterion of a live performance which communicates, is faithful to the composer's intentions and moves me in the here and now; one which makes me feel that I never need to go in search of a "better" or "best" performance of the same work, and leaves me keen to seek out those players in a full length concert. That is a very subjective judgment, and one that would be unlikely to accord with the average of the judges' points awards, and indeed it did not do so. Preliminaries: The Paizo Quartet in Nielsen and Beethoven; the Jupiters Quartet in Brahms no.1 and the Faust Quartet in Schumann. None of those my choices reached the Finals, which for us was a dispiriting evening. The Johnstons gave a lack-lustre account of the same Mendelssohn op.13, received enthusiastically by their vociferous supporters. The Biavas displayed impressive qualities of technique and ensemble, but in a seriously misconceived interpretation of Ravel's quartet, milking every bar and phrase for an excess of 'expression'. The Atrium Quartet from Russia, on this showing alone, should have won for the integrity and accomplishment displayed in a powerful account of Shostakovich's bleak 5th quartet, which they attacked appropriately with a vehement manner and harsh tone quality to start and finish, not dissimilar to the sound of their unsympathetic approach to Beethoven's op.59/2 the previous evening, and a glassy stillness in the slower central sections. With a full interval after each piece (which stretched the concert to three hours before the Jury retired to consider their verdict!) there was ample opportunity to talk amongst the audience; the talk was of surprise at which quartets had qualified for the Finals. Being restricted to those three quartets, we did not cast our votes for the Audience Prize, but had we been obliged to commit ourselves, we would have favoured the Russians. 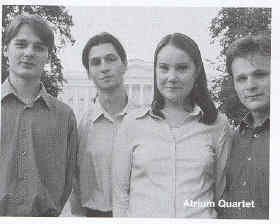 Only formed in 2000 the Atrium Quartet has achieved remarkable results in its short history. It was awarded the diploma of the 5th Shostakovich International String Quartet Competition and then went on to receive the 2nd prize and the jury's Special Prize in the 6th Shostakovich International String Quartet Competition the following year. In April this year the Quartet received 2nd prize in the 7th Ente Triennial International String Quartet Competition in Cremona (Italy). 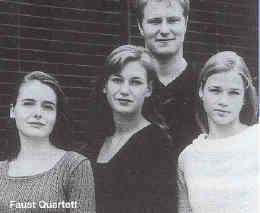 The Quartet is currently studying at St Petersburg State Conservatory. 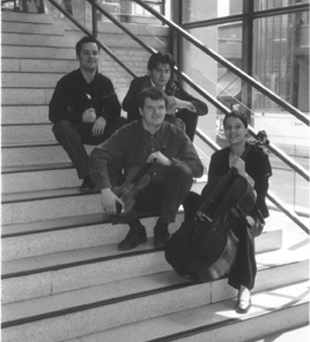 The Johnston Quartet was formed in September 1998 at the Royal Northern College of Music where its founder members were undergraduate students. Having graduated, the quartet members are now Junior Fellows at the College. The quartet has received masterclasses with members of the Endellion, Sorrel, Nossek, and Ysaye quartets. It has appeared extensively throughout the UK and has performed in festivals such as the 1999 RNCM Haydn Festival, 2001 Beethoven Festival, the Aldeburgh Festival and 2002 SchubertFest where it performed Schubert's string quintet with Ralph Kirshbaum. Formed in the autumn of 1998, the members of The Biava Quartet are currently studying at The New England Conservatory of Music in The Training Program in The Art of The String Quartet under the direction of Paul Katz. Recent graduates of The Cleveland Institute of Music, The Biava Quartet has been the recipient of numerous honours and was most recently awarded second prize in the 2002 Young Concert Artist International Auditions where it also received The Barenreiter Prize. 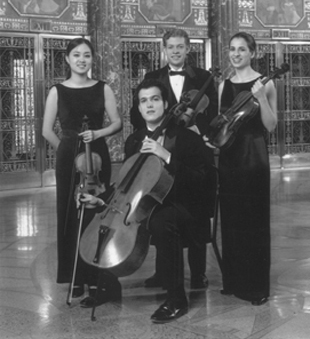 In addition, the quartet participated in the 2002 Great Lakes Chamber Music Festival as Shouse Artists, the 2002 Pro Quartet Academie in France, the 2002 Juilliard Quartet Seminar at Lincoln Center, the Aspen Center for Advanced Quartet Studies as fellowship recipients in both 2001 and 2002, as well as The 2001 Isaac Stern Chamber Music Workshop at Carnegie Hall. My report above was completed before the results came through to me the following morning. Having been critical of the line-up for the Finals (based upon my very partial knowledge of the overall performances through the stages) I am pleased to find that the decisions of Jury and Audience were absolutely in agreement with my own opinion. Competitions remain a constant topic for heart-searching questioning, most recently Neville Abraham's from the platform introducing the Finals, and there are some respected critics who refuse to attend any. Understandable misgivings about the effects upon most competitors of inevitable 'failure' have to be balanced by acceptance of the established and seemingly inevitable place of music performance competitions in the scheme of things, and by their fascination. Unsuccessful participants told us that coming to London had been an enjoyable experience and learning opportunity, and it was good to learn that the judges had given a great deal of their time to informal discussion with the quartets which did not qualify for the finals. The London Triennial, which I have covered for a decade since it moved from Portsmouth to the City, has a very good track record, with past winners including Takacs, Hagen, Vanbrugh, Vellinger and Belcea amongst those that continue to hold a high profile in UK. Our week of string quartet fancying brought to mind also the problem of sustaining individual technique at peak level, and the closely related one of cementing the personal relationships which are axiomatic if a young quartet is to survive and flourish after the members have added enough prizes to their CVs. Two of this year's examiners were founder members of the legendary Amadeus Quartet, which continued to dominate British chamber music life until the sudden death of their violist, upon which they disbanded rather than seeking a replacement. The next undisputed UK champions in the field were The Lindsays, who have completed 25 years together and are planning to disband in the near future. They are surely entitled to rest on their laurels, which include an impressive discography, but I have found their playing in recent years exciting but all too uneven. After their South Place concert in December I wrote that 'The Lindsays played as well as I have ever heard them - and that is very good indeed! ', but on 5 April, before a small audience at Wigmore Hall, their performance of Beethoven op.18/6 was so rough that it could not possibly have passed passed for the preliminary stages of this competition (Lutoslawski's quartet was lucid and seemed to have taken up their rehearsal time). As against that, a few days earlier I went to hear the veteran Panocha Quartet, whose members had been together since they were students together in 1968, and found their playing still "mellow and fastidious, yet lacking nothing in comparison with the more overtly dramatic and virtuosic performances we have become used to". Perhaps, alongside competitions to help launch the careers of young musicians, there should be other awards to groups for longevity and 'life contribution'? The organisation and funding of this model competition is a mammoth task for which everyone should be grateful, a learning experience for all which justified giving it more time than is possible for print reviews writing in non-specialist newspapers and music journals; it is hoped that our small criticisms will be taken in good part, and read by those interested alongside our analyses of piano and voice competitions (solo and choral), which were a speciality of Seen&Heard before the recent launch of Musical Pointers. *Note: BBC R3 is broadcasting Highlights from the London String Quartet Week each morning 13-17 April. I have caught the Faust Quartet playing Berg, which confirmed my favourable impression of them from the first round, and the Paizos playing Shostakovich to my greater satisfaction than did the Russian eventual winners. 33 quartets from 17 countries applied to enter the Competition and over a weekend in November in London, the Invitation Jury had the tough job of reducing these entries down to a maximum of 12 quartets to be invited to London to compete. Members of the Jury included Corina Belcea, first violin and founder of the Belcea Quartet, prize-winners in London, Bordeaux and Osaka over the last five years. Martin Lovett, cellist and founder member of the world-renowned Amadeus Quartet. Simon Rowland-Jones, founder violist of the Chilingirian Quartet, composer, editor of the new Peters Edition of the Haydn Quartets, and Professor at the Royal College of Music in London and at the Malmo Musikhogskolan, Sweden. Jill Segal, Director, Connaught Artists Management, who manage a number of young string quartets. Georges Zeisel, Director of ProQuartet European Centre of Chamber Music, Paris. Eleven young string quartets from around the world were selected by the Invitation Jury to come to London to compete in the Ninth International Competition in April this year. To receive an invitation to the Ninth Competition, entrants had to submit an audio recording of a performance of anyone of Haydn's Op. 76 or 77 quartets and any significant work composed from 1908 to the present day. For the first time in its history, the competition also asked for a video recording (first movement of any significant work composed between 1827 and 1907). Over the weekend, the Jury listened to and assessed the recordings, both as individuals, collectively and at all times without knowing the identity of the quartet concerned. Initially the audio recordings were distributed randomly amongst the individual jurors, who were asked to mark each work out of 10 (with 7 or more for serious consideration). Each juror's batch was then handed to another juror for a second assessment, and those with the highest aggregate marks went through to the next round (18 quartets). As a precaution, the jury then collectively heard the next best seven recordings (Haydn only) which had not automatically gone through, and selected the three best, making 21 in total, to go through to Stage 2. These were again randomly distributed to each juror who was asked to mark 'yes' or 'no' in answer to the question "In your opinion does this quartet have the ability to reach the Competition's closing stages?" This time each batch was assessed by three different jurors. Three verdicts of 'yes' automatically triggered an invitation to London, those with three 'no' votes were eliminated. For the remainder the jury then decided to hear all the first movements of the Haydn again 'incognito' in random order, followed by a secret ballot and no discussion. A further four quartets came through this final stage with two more very good entries placed by the jury on a "reserve" list in case of cancellations. The videos of all potential invitees were screened to verify their authenticity before the entrants were informed of the result. The Invitation Jury was impressed with the generally high standard. The Foundation would like to thank all the entrants for their time and patience. The jury will be present throughout the Competition and have access to the scores of the works performed. The first stage of the Competition is taking place at the Royal Academy of Music in the Duke's Hall. Over three days each ensemble will be asked to perform a significant quartet of their choice composed between 1827 and 1907, a significant piece composed from 1908 to the present day, one of the last ten Mozart quartets and a compulsory piece, the quartet "Ainsi la Nuit" by Henri Dutilleux. At the end of the three days, the majority rankings of the Competition Jury will determine which quartets (up to six) go forward to the next round - the Semi-final. The Semi-final will take place during the evening of the 8th April at Wigmore Hall. 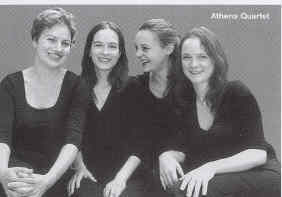 Each quartet will be asked to perform one Beethoven quartet of their choosing. At the end of the evening, the majority rankings of the Competition Jury will determine which three quartets will perform in the Final the following evening at Wigmore Hall. Each finalist will have already chosen the two quartets they would like to play and placed them in their order of preference. These nominations will have included a (different) work composed between 1827 and 1907 and another composed from 1908 to the present day. The Competition Jury will be directed to assess each stage afresh, normally without reference to the previous one. Each member will be asked to place quartets in their own order of preference at each stage with no prior discussion, and therefore with no need of a chairman. The decision of the Jury is final. Communication with Jury members by contestants, or on behalf of any contestant, is prohibited.